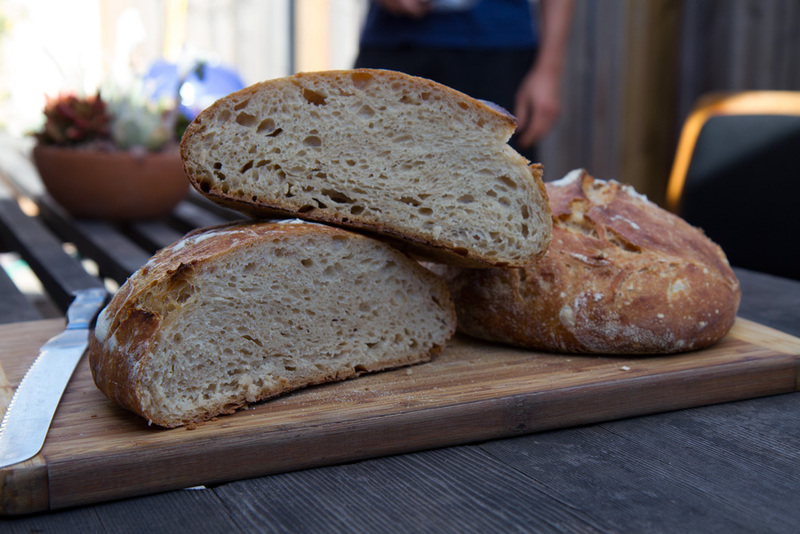 Each day I look after my aging meats, as Brad feeds his hungry sourdough starter. I’m making bacon and he’s baking bread. We simply add a fried egg or a glass of wine, depending on the hour. When Brad and I decided to move to California from New York, the question was posed, “will we miss having seasons?” As far as weather goes, the Bay Area has a pretty consistently mild climate that could be considered “seasonless” by East Coast standards. No, we didn’t have to shovel our car out of a foot of snow while bundled up to endure sub-freezing temperatures in February, and I don’t expect I’ll ever be desperate for air conditioning wondering if the August heat will drop below 100 degrees long enough to allow me to sleep through the night. But when it comes to food there are most definitely seasons, and their cycles are not all that different from the ones we knew before. Except that they seem to be moving at ludicrous speed. The strawberry season has been long and sweet. And while I think we’re finally coming to its end, the most recent fruit has been the sweetest of all. 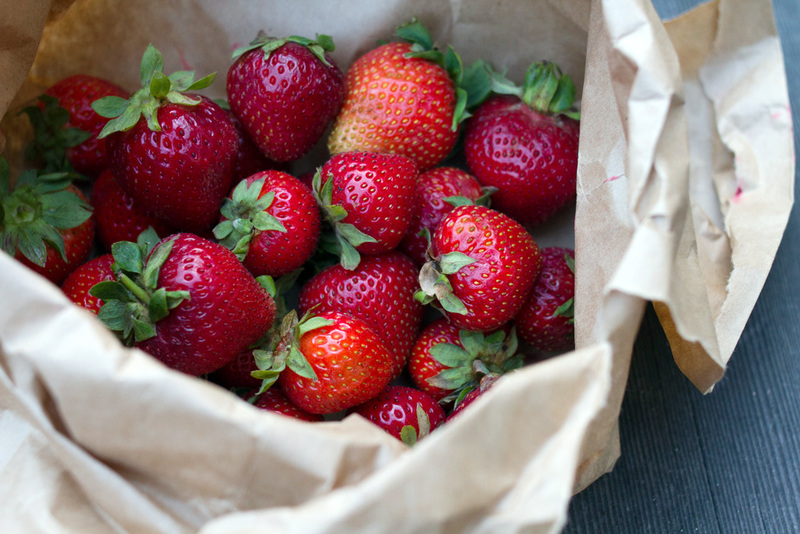 It seems strawberries, like grapefruit, only get better as the late season heat results in a concentration of sugar. My friend Matt was so surprised by the their sweetness he suggested we make agua fresca with “just some water, a blender, that’s it!”, well, sort of… But if you’re feeling ambitious and wondering what to do with all those delicious, yet highly perishable strawberries you couldn’t resist the urge to buy at the farm stand, make yourself some ice cream. 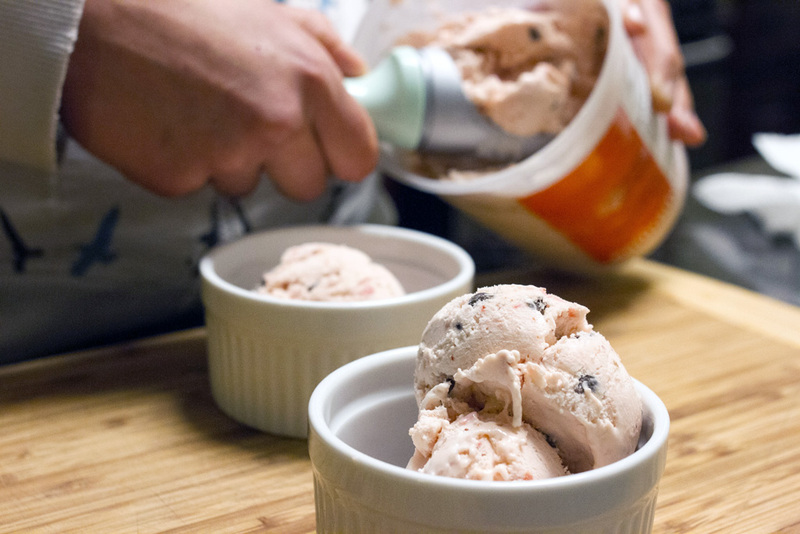 Brad and I recently unpacked our ice cream maker and gave a recipe from the Gourmet archives a whirl, and because we were feeling feisty, we threw some chocolate chips in too. The result was divine. I’ll be using this as my base for many fruit ice creams to come this summer. 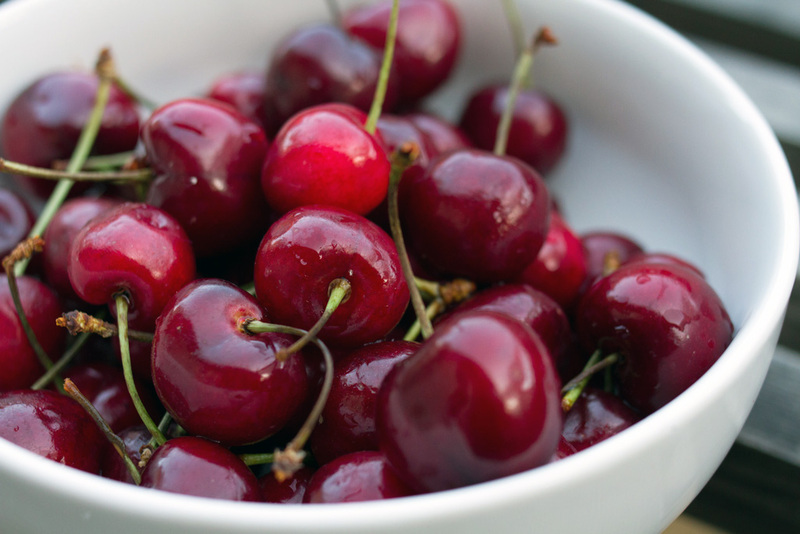 Up next, cherries and sugar plums before they’re all gone! Combine the cream and salt in a heavy saucepan and bring just to a boil. Remove from heat. Whisk the eggs with 1/2 cup sugar in a bowl, then add the hot cream in a slow stream, whisking. Pour back into the saucepan and cook over moderately low heat, stirring constantly, until slightly thickened and an instant-read thermometer registers 170°F (tip: remove it as the temperature is creeping past 165, do not let it begin to boil!). Immediately pour your custard through a fine sieve into a metal bowl, then cool to room temperature, stirring occasionally (you can set the bowl in another bowl with ice water to speed this process). Chill, covered, at least until cold, about 2 hours, and up to 1 day. While the custard is chilling, mix the strawberries with remaining 1/4 cup sugar and lemon juice. Remove half to a blender and purée until smooth. Smash the other half with a potato masher, them combine and stir into the chilled custard. Freeze in an ice cream maker. When the ice cream had reached your desired thickness, add the chocolate chips, then transfer to an airtight container and put in the freezer to harden. 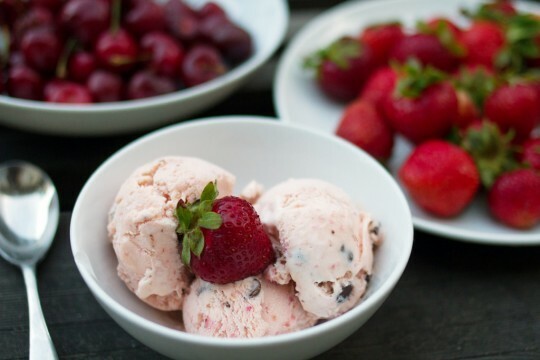 *Variation: I just made this ice cream again with sugar plums and it was fantastic! Pit the plums, combine them with 1/4 cup of honey (sub for 1/4 cup sugar and lemon juice) and heat gently, stirring frequently, in a saucepan until the fruit breaks down and the whole mixture is syrupy. Force through a mesh strainer and discard the remaining skins. Allow to cool and proceed to combine with the chilled custard. Radishes, scallions and grass-fed beef dusted with cumin and destined to be folded into a warm, homemade tortilla. We’re building a new nest in Oakland, and within it, a backyard oasis. I dream of summer night dinners, weekend barbecues, and bacon, lots of bacon, smoking on our pretty new grill. 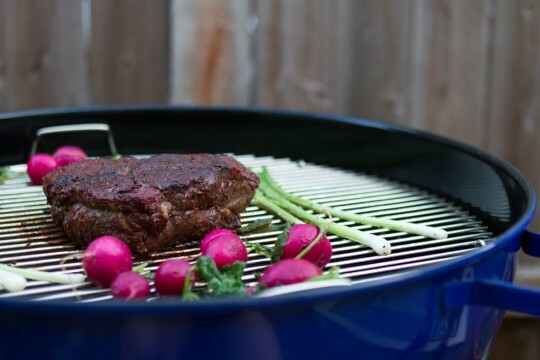 This blue beauty is the start of a Grillquest we’ve only just begun. Forget any preconceptions you may have about “liver and onions”, or visions of sad children endlessly chewing and gagging for fear that dessert will be withheld. 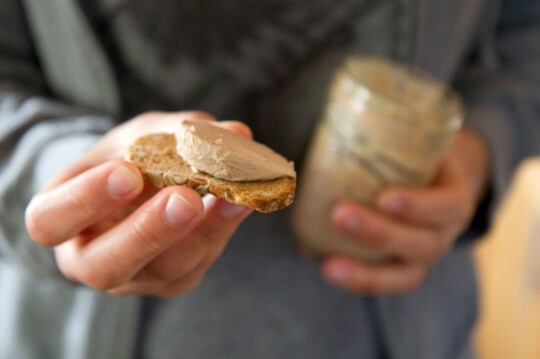 Imagine instead that you serve up a pretty little terrine of chicken liver mousse made of yes, liver and onions, but also butter, and bourbon, and cream, and love. You tell your dinner guests what it is, watch them eye you suspiciously, then gingerly spread a timid serving on toast and take a bite. Then you wait, while they experience the magic that is this rich, airy decadence, and proudly watch them go back for more, and more. My friends, I have seen this magic with my own eyes. Even the most skeptical eater is always a lover after a taste. And the cheap part? Well, a pound of chicken livers, some quality whipping cream (assuming you’ve got butter and a bottle of bourbon on hand from which you can steal a splash), and a baguette will set you back a mere $10 or so. 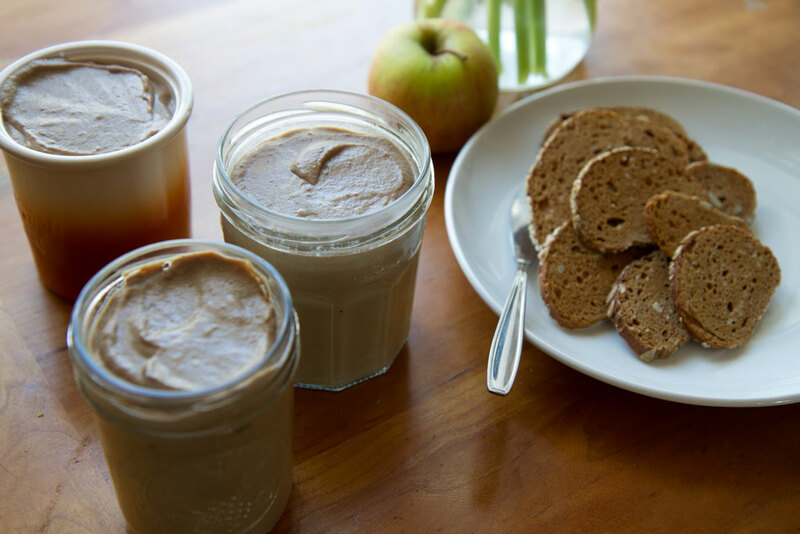 For that you can serve some delightful homemade paté at your next dinner party. I should probably mention chicken liver mousse is also perfect for picnics. Heat 2 tablespoons butter over medium heat in a skillet and cook the onions, seasoned with salt, stirring occasionally until golden and tender (about 10 minutes). Add the thyme and toss with the onions until fragrant. Add the bourbon and deglaze the pan, stirring until most of the liquid had reduced. Remove to a bowl. 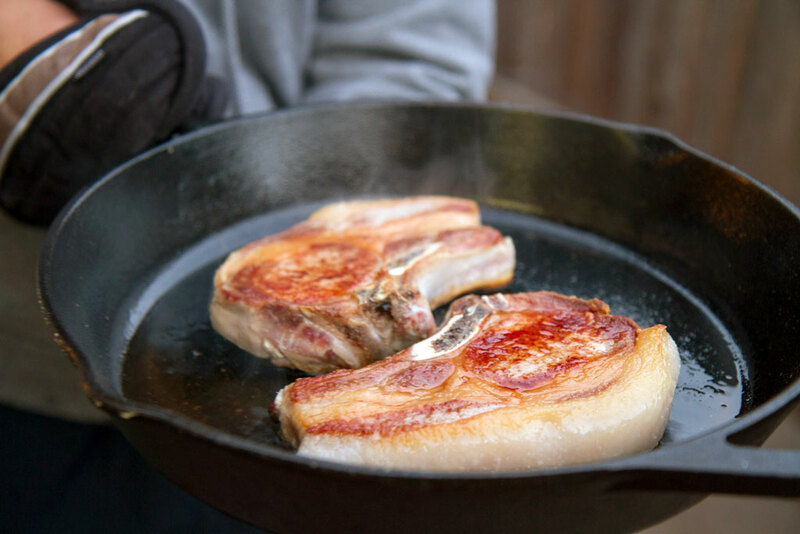 In the same pan, over medium-high heat, melt the remaining butter and cook the livers. Toss them around in the pan until they’ve stiffened and are uniformly dark on the outside but are still pink inside (about 3-4 minutes). Remove from heat. 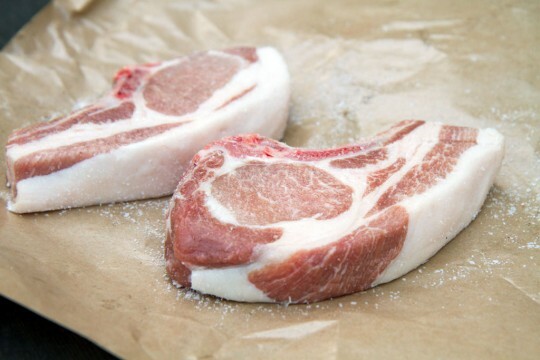 Combine the livers and the onion mixture in a blender or food processor and puree until smooth. 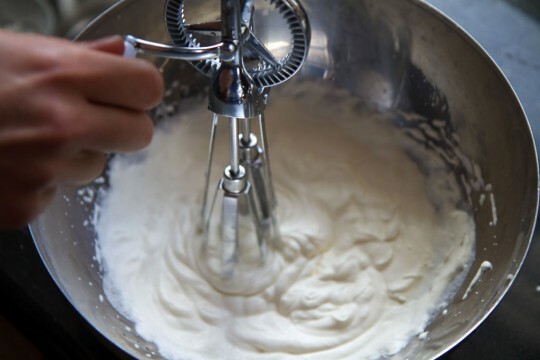 Meanwhile, in a clean, non-reactive bowl, whip the cream until it forms peaks. Gently fold the liver puree into the whipped cream, adding a grind or two of fresh black pepper if you’d like. Transfer the mousse to several ramekins, mason jars, or any small serving dish you’d like, cover and refrigerate until completely chilled and set. Before serving, remove the mousse from the refrigerator and allow to warm to room temperature if you can wait that long. Serve with crusty bread (or apple slices if there are gluten-free folks in your company) and a perhaps a bit of whole grain mustard on the side. I started making this recipe last year when I was regularly butchering chickens at North Mountain Pastures and had endless access to fresh, healthy chicken livers. 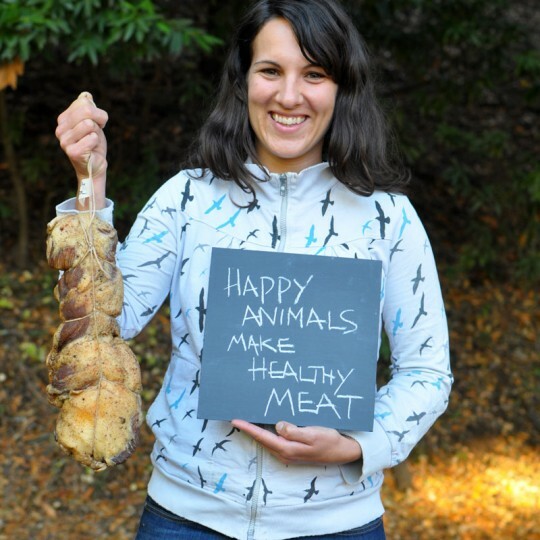 Since arriving in California I’ve been apprenticing at The Local Butcher Shop in Berkeley, where we receive twice weekly deliveries of gorgeous chickens and all of their tasty organs from Amber and Son just north of us in Sebastopol. 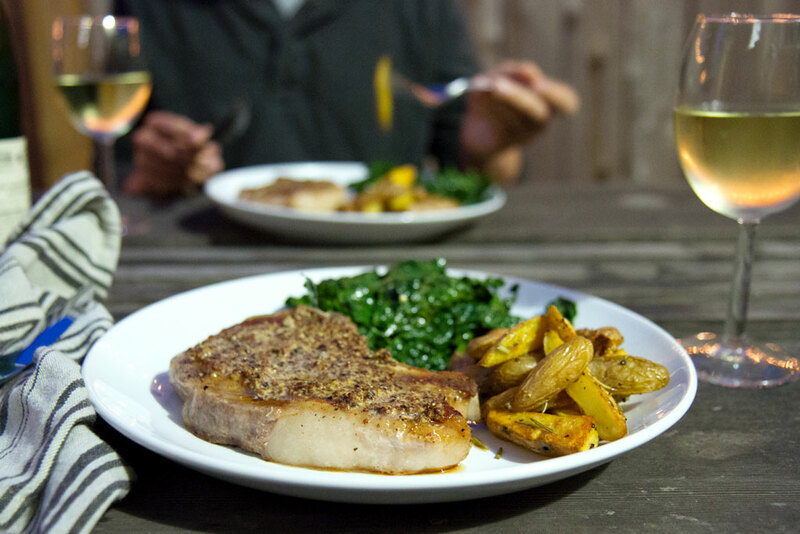 For the good of your taste buds, your health and the planet, I encourage you to find a local a source for meat from well-raised animals. 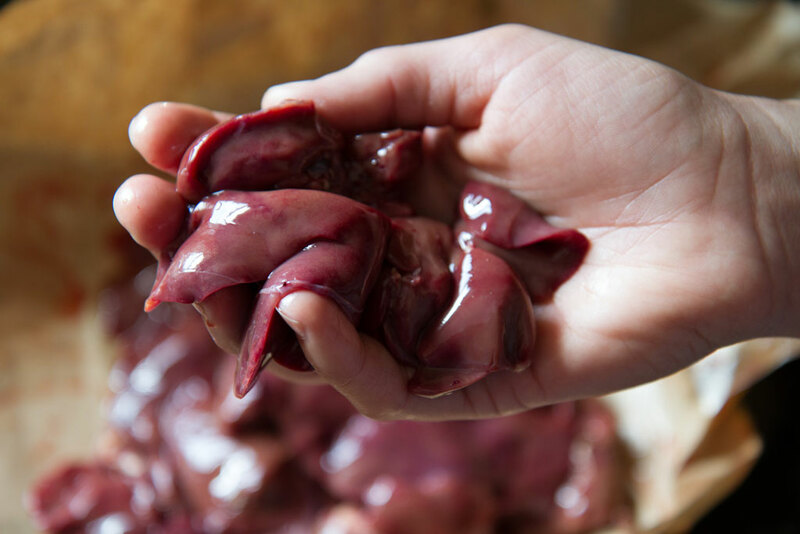 I recently spotted some rich, red chicken livers at the Whole Foods butcher counter, so if you don’t have direct access to farmers and pastured chickens, perhaps you can start your search there. Happy Eating! While the rest of the country was watching the Super Bowl this past February, Brad and I were hurtling across the desert of Southern California at 70 miles per hour – a pace we had been keeping for most of the past six days. In the coming weeks we would hear that our East Coast friends and family were hunkering down for yet another snow storm, while we headed out to explore another new hiking trail with our dog Francine, or to stock up on some more local citrus at the second, or maybe third, farmers market of the week. We moved to California, Oakland actually. A whole continent away from the life we have known together in Brooklyn for nearly 10 years. When we drove away from our beloved brownstone apartment Brad looked at me and said, “Well, we’re officially homeless.” We’ve since been shacked up in someone else’s apartment with furniture that is not our own in a city where we still feel like visitors, but the welcome we have received in California has been warm – and I’m not just referring to the weather here. Our new lives are already full of family and friends with whom we’ve shared memorable meals and experiences since the day we arrived. And that road trip with the dog, three bicycles and as much as we could fit in our station wagon across this very big country? Well, it was epic. True to form we set out with little more than a plan to head west, and our days and routes were dictated by a continuous search for the next great meal (if you’re curious, I kept a little #opRoadFood diary on Twitter). There were goodbye dinners with family in NJ And PA, biscuits and gravy for breakfast in WV, and BBQ for dinner in TN and AR. We ate chili on Frito pie in OK, and burritos, tacos and more burritos in NM and AZ, smothering everything we could in green chili. And when we finally arrived in sunny CA, all I wanted was a salad. 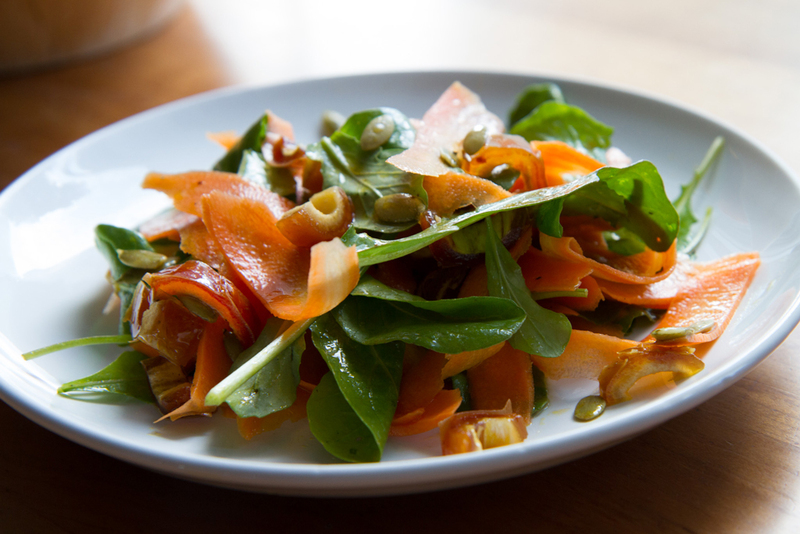 On our first night in Oakland I satisfied my craving with a raw carrot and date salad. We enjoyed it while toasting our arrival with friends who had been awaiting us, and it quickly become a staple at shared dinner tables throughout the tale end of our first California winter – if you can call it that. I’m sorry to make those of you on the opposite coast jealous, but even in February, leafy greens and colorful collections of sweet carrots are plentiful. 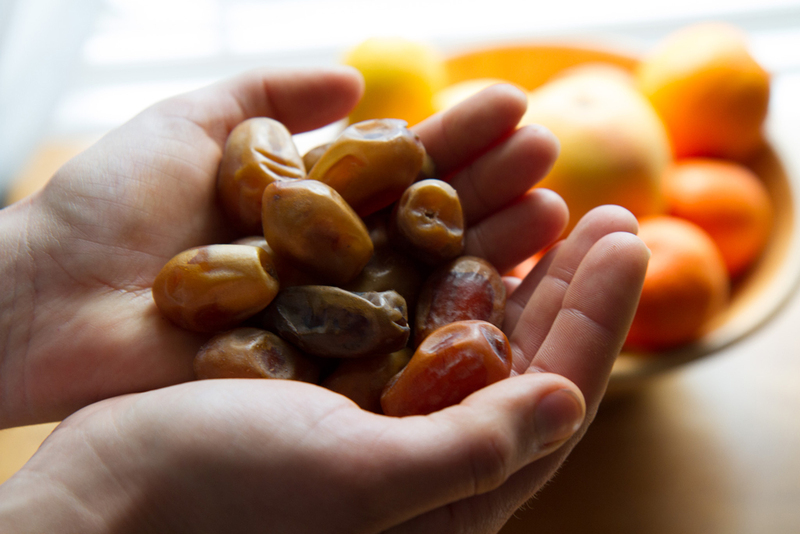 There are more varieties of dates than I ever knew existed, and they’re local. It’s March now and strawberries and asparagus have already sprung. I hear whispers of fava beans, and I don’t think I’ll ever grow tired of local avocados or oranges, clementines, tangerines, grapefruits, pomelos and of course, lemons. I miss the friends and family we left behind dearly, but when it comes to cooking and eating good food together, I couldn’t feel more at home than I do in this place. 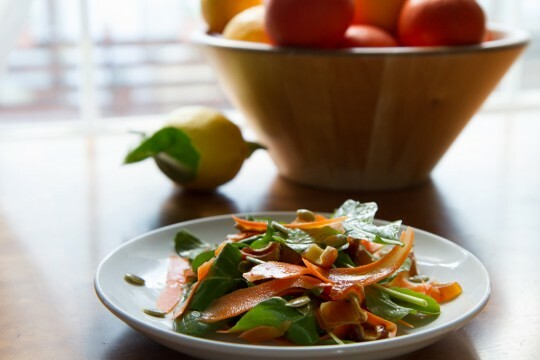 Using a vegetable peeler, peel and then shave the carrots into a salad bowl. 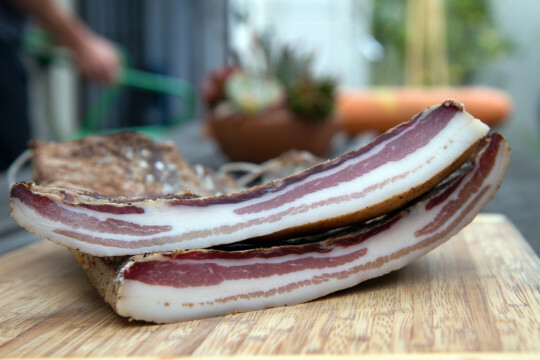 Slit the dates lengthwise, pull them apart and remove the pit (discard), then cut into 1/4″ slices. Add to the salad bowl. Toss in the pepitas. In a small bowl or cup, whisk together a quick vinaigrette of 2/3 oil and 1/3 vinegar (or a few tablespoons oil, a splash of vinegar and salt and pepper to taste). Toss the contents of the bowl with the vinaigrette. 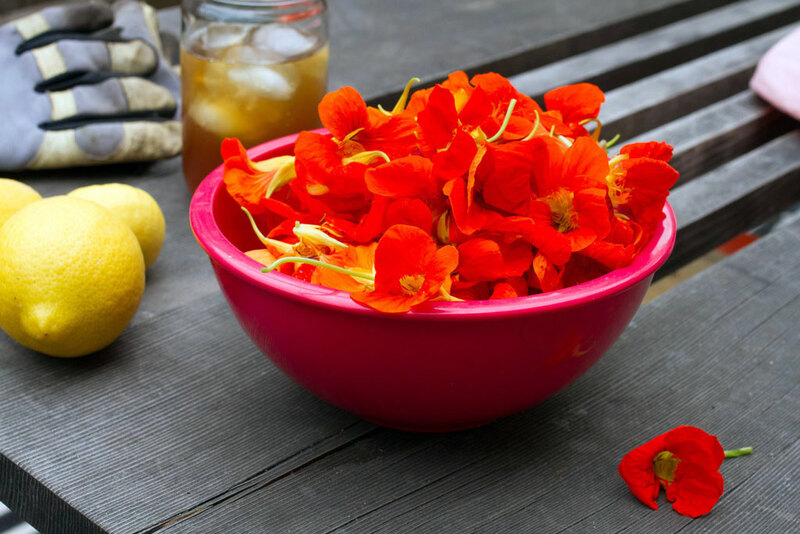 Meanwhile, wash the arugula in your salad spinner, finish preparing your meal, and when you’re ready to eat, gently toss the arugula with the rest of the salad just to coat it with the vinaigrette and pile the salad on a plate. Enjoy with friends. If you’re feeling very California you could use almonds in place of pepitas. Also, my sister-in-law likes to top the salad with a few shavings of Parmigiano Reggiano and I very much approve of this embellishment. 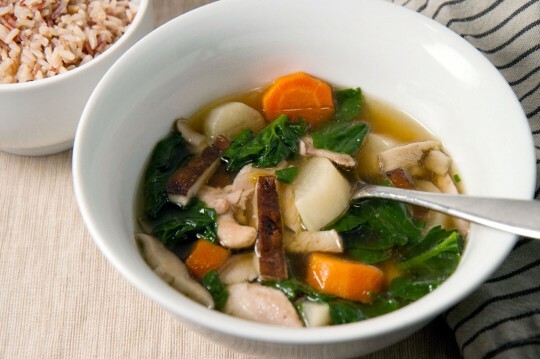 It’s been quite some time since I’ve shared a recipe on this website, but if there was ever a dish for a comeback, this fragrant chicken soup is it. If you’re like me, and are trying to ween yourself off what has become a daily ration of Christmas cookies and other sweet treats, a healthy soup loaded with ginger and vegetables is the perfect follow-up to holiday decadence, not to mention just right for a cold winter day. While I was still living on the farm this past fall and the cold air seemed to have crept into our trailer for good, all I wanted was something to warm me from the inside. 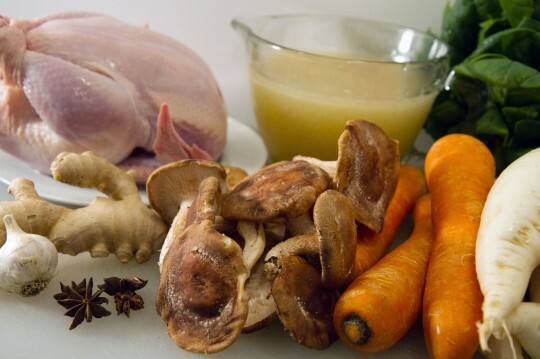 We had plenty of homemade chicken stock on hand (do you know about the health benefits of bone broths? ), so I browned some legs and thighs, added some stock and tossed a big pile of cut up veggies into a pot. I let everything simmer together for an hour or so, pulled the tender chicken off the bone and stirred it back into the soup along with several handfuls of hearty greens. The result was a rich and satisfying soup with little effort, and it only got better in the days to come. Once I returned home to Brooklyn I decided to make another pot of chicken soup, but this time I spiked it with Asian flavors inspired by this recipe from Melissa Clark – a favorite from last winter. I love the smell of ginger and star anise wafting through the apartment as the soup simmers, and the way the big chunks of daikon radish and carrots drink up the broth as they become flavorful and tender. Sesame and Ginger Chicken Soup is now a staple of the Thomason household, much to the enjoyment of Brad and several of our friends who have dropped by just in time for me to ladle them a bowl of hot chicken soup. In a large stock pot, heat 2 tablespoons sesame oil over a medium-high heat. Add the chicken parts in a single layer, skin side down, and allow to sizzle until they’re golden brown (about 5 minutes). Remove the chicken to a bowl, add some additional oil to the pot if necessary, and sauté the ginger and garlic for 2-3 minutes, stirring frequently until very fragrant. Add the stock, water, chicken, carrots, radishes, soy, mirin and vinegar. The liquid should just cover the contents of the pot. Allow the soup to come to a bubble and skim off any foam that floats to the surface. Add the mushrooms and anise pods and reduce to a simmer. Allow to cook for about 1 hour until the chicken is tender and easily pulls away from the bone. Remove the chicken from the pot and allow to rest on a cutting board until cool enough to handle. Remove and discard the skin. 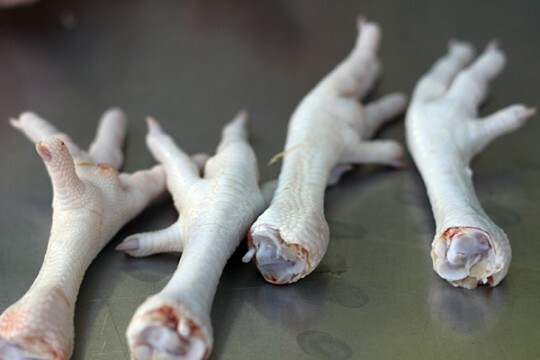 Pull the chicken off the bones and tear into roughly 1″ thick pieces. Return the chicken pieces to the pot and stir in the spinach until just wilted. Serve the soup, garnished with a few drops of sesame oil. You may also wish to serve some chili paste and rice on the side to spoon into the soup as desired. As a child all I drank was milk. This is not an exaggerated statement, my parents will back me on this one. What did I want at every meal? Whole cow milk. When I was tired and thirsty from playing, I drank milk. Even when the other kids asked for juice, I asked for milk. And then when I was 10 years old I suffered a freak medical complication when doctors discovered 2 golf ball-sized calcium deposits in my gall bladder. I have a scar that runs from just below my sternum to my belly button to prove it. I don’t know if it was my transition into diet-conscious teenagehood or my later adult doubt that given the absence of my gall bladder it wasn’t really good for me, but at some point I stopped drinking milk. On a rare occasion Brad and I would grab a quart of the good stuff to wash down some cookies, but I had all but suppressed my love of the liquid gold until I moved to North Mountain Pastures. 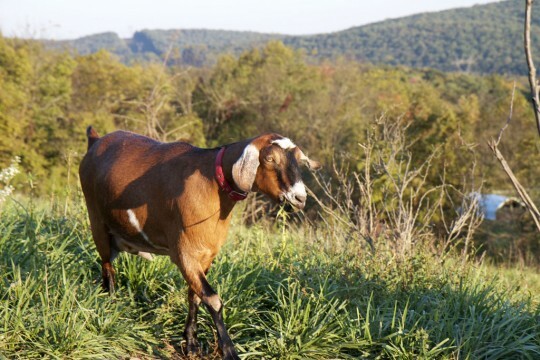 Here there is herd of Nubian goats who roam the farm, grazing freely, and provide us with about 3 gallons of raw milk a day. Between the 6 adults and 2 children living here, we drink it all. At first it was just with meals. I quickly adjusted to the routine habit of grabbing a mason jar and pouring myself a glass or two at the table. I would resist pouring a third. But as the farm season wore on, and the long days of farm work caught up with me, I stopped getting up early enough to eat breakfast and starting drinking more milk instead. I found that the delicious, cold, creamy beverage was not only the perfect refresher on a hot day, but it seemed to be a good source of protein and calories that could keep me going through hours of farm chores or a long day at farmers’ market. Lately I consume a half gallon per day, sometimes more. In a recent chore rotation it finally became my turn to milk the goats. I was all too happy to do my part in providing the tasty stuff I’ve grown so dependent on. But I also found myself looking forward to the quiet solo hour in the barn spent cultivating trust and milking these wonderful creatures. Like any animals, they are conscious of your energy and mood. Keeping them calm while you sit by their side, yanking on their udders, or “nu-nus” as we call them, is a task I love. When Red Sonja gets fussy I just give here a moment and stroke her side. And when Gracey gets cranky and threatens to kick the bucket, I’ve found a little singing will chill her out. 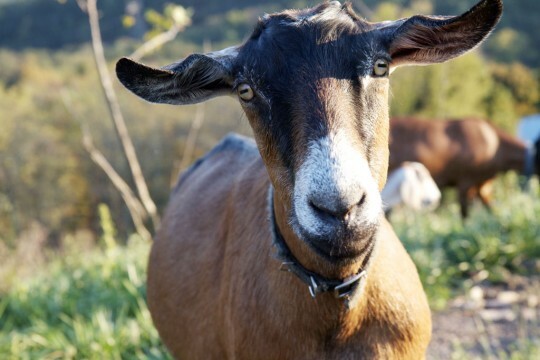 I love to pet their cheeks and thank them before they leave the milking stand, particularly Baby, who always gazes intensely back at you with her freaky alien-like goat eyes. 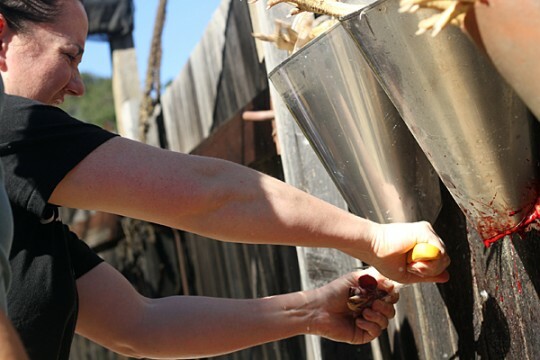 After milking I carry the frothy buckets back to the farmhouse to filter the fresh milk into jars and pour myself a glass or three of the cold stuff from the fridge. The goats go about their day and so do I, fueled by raw liquid gold. I wonder if I’ll ever be able to quiet the milk monster in me again.